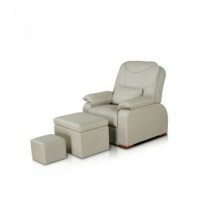 They attach great importance to a sophisticated ambiance in your salon? Their clientele is very demanding, both in terms of the professional performing the treatments as well as with respect to the interior and the equipment used? Then we have the facial bed KPE 4-1 from real wood the right furniture for you. And at a price that will blow you away. The KPE-4-1, we can offer a visual and functional highlight for her salon. In customer surveys, this deck gets top ratings ever, both by the users for their functionality and ergonomics as well as visitors to the rooms for their comfort and beautiful design. 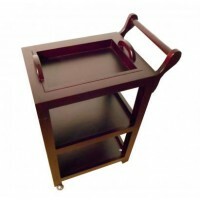 The cosmetics and massage table KPE-4-1 is universally applicable and robust. The exclusive use of high quality materials and components guarantees a long service life. It offers maximum comfort and can be adapted by its variety of settings suited to different working conditions and applications. The particularly stable frame is made of beechwood and is characterized by highest stability with minimal low weight. In this base also a shelf for towels and consumables has been integrated as well as a smaller, single-accessible unit with hinged door. The lying surface consists of two padded segments, the slope of a segment is manually adjustable in 10 different positions. At this variable segment also includes a removable headrest with built-in face opening is attached. This makes the sun particularly versatile in the applications. 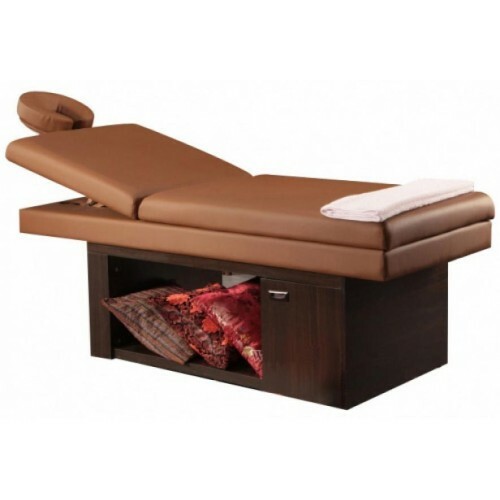 The padding of the massage table is made of 13 cm thick, high quality and durable PVC, ensures that functional and well-groomed appearance over a long period. The surface is smooth and consists of a pleasant, oil and water repellent synthetic leather which can be cleaned easily using commercially available disinfectants. Whether in beauty or massage parlors, clinics, doctors offices or hospitals - the cosmetics and massage table KPE-4-1 has proved itself in practice well. The price for this looker will surprise you, but we have placed great emphasis on an excellent price-performance ratio in this model. For this model, we provide one year warranty.